Comments Planetary gem therapy is the best way to get the favorable forces working for oneself – to make the road to destiny interspersed with pleasant events and a better life experience qualitatively. Featured today is a talisman that incorporates two kinds of gems that help in unique implementation of gem therapy. There is a beautiful deep burnt cinnamon orange colored Hessonite from Sri Lanka. The gem of 4.82 carats is cushion cut gem – fully natural and treatment free, with excellent clarity and has been set in sterling silver. 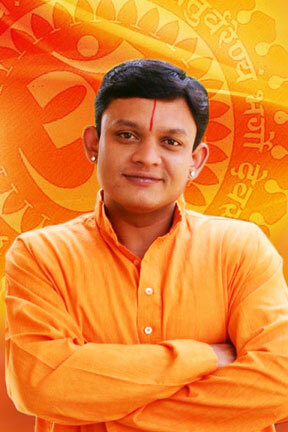 The excellent jyotish weight ensures that the Gem will give the best results related to Rahu’s planetary energy. On the shanks in relief stands the symbol of Mercury and in the circular part have been ensconced, two calibrated round Natural and treatment free Colombian emeralds weighing a total of 0.87 carats. They have a deep rich emerald green color. The patron in question already wears a 2 + carat natural emerald but was keen on adding to the weight without giving up his gem which has become a lucky talisman of sorts for him. The resolution came about and how! Natural Hessonite or Gomedh/ gomeda is the gemstone of Rahu also known as the North Node of the Moon. And natural emerald / panna is the gemstone of Mercury/ Budh. 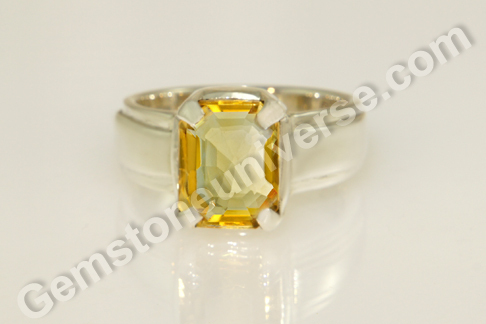 Comments Yellow sapphire is a wonderful gemstone that carries within it benevolent energies of Jupiter. The gem is a harbinger of good fortune. Featured today is a 5.41 Carat natural unheated Ceylon yellow sapphire set in 22 karat yellow gold as a Jupiter Talisman ring. The symbol of Jupiter stands in relief on the shanks of the ring. 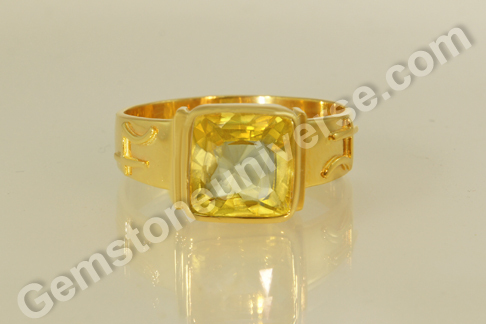 The cushion cut gem has a top canary yellow color with lustre and excellent clarity. The yellow sapphire also known as pukhraj is the gem of the planet Jupiter /Guru/Brihaspati and is used to harness its planetary energy. One must be very careful while buying a yellow sapphire. It is sometimes very difficult to differentiate between golden yellow colored natural glass, synthetic sapphires, quartz, scapolite, heat treated sapphires etc. for they almost look the same. And then for planetary gem therapy, one requires a treatment free- natural gem that excels on the 4 Cs of cut color clarity and carat weight and is free from any dosha listed in the sacred texts i.e. jyotish quality gem. Insist on getting certification for your yellow sapphire or any gem for that matter when you are buying it. Refractive index of each of the materials mentioned above is different. It always pays to educate yourself about the basics, just to make sure that you buy intelligently. 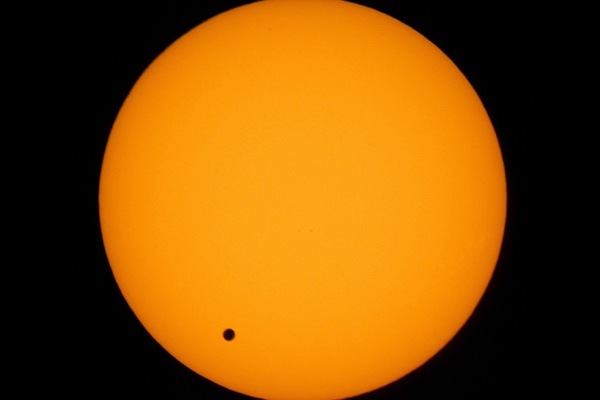 The world witnessed a rare and a beautiful celestial spectacle today, The Transit of Venus. From the Earth, this phenomenon is seen when the Venus passes between the Sun and the Earth. It occurs in intervals of 8, 121½, 8 and 105½ year. This was the last transit of this century and the next one will occur in the year 2117. On this rare event, we at Gemstoneuniverse present our patrons a gift of Venus with its infinite blessings and hope that these Gemstones bring in love, light and luxury in your life, the essential Venus Attributes. Presenting in front of you our first batch of top quality flawless, white/ Colorless Zircon from our rough” Sristhi”- Creation. Every single Zircon from this lot rivals the brilliance of a Diamond. Zircon is the single member of the zircon group of the nesosilicates that is suitable for use as a gemstone. Top Quality Unheated and Radiation free Zircon is the most preferred Upratna/ superior Alternative gemstone for Venus and is used in Planetary Gemology to harness the best that planet Venus has to offer. Hindu poets tell of the Kalpavriksha Tree, the tree of miracles capable of granting all wishes, which was a lustrous, resplendent tree covered with gemstones as fruits with leaves of zircon. On this auspicious and significant Venus transit day of 06th June 2012, Gemstoneuniverse presents its patrons a gift from Venus with infinite blessings. Top Quality Flawless White Zircon from Sri Lanka that is free from heat treatment and any enhancement such as radiation. Want to know what makes planetary gems special, well, use this video as a reference point and see why these Gemstones are special and deliver those special results. – Absolutely, top quality Colorless zircon. – Lustre brilliant rivalling the top quality Diamond. – Totally Free from any enhancing treatment such as Heat or Radiation. – Price: No wholesaler or retailer can match price, range or brilliance of these goods even by a 100%. THAT- Is the Gemstoneuniverse value or commitment. We await your testimonials once you have experienced the power of Venus. Look at the lovely natural Imperial golden yellow topaz from Brazil of 3.06 carats set in sterling silver as Jupiter talisman ring. The gem is a classic emerald cut with amazing imperial golden yellow color and excellent clarity. The gem is loupe clean and is free from any treatment. Golden imperial yellow topaz is the substitute gem for natural yellow sapphire/ pukhraj gemstone and is used to harness the saatvik energies of Jupiter / Guru/ Brihaspati. Look at this imperial golden yellow topaz and then take a look at citrine and you will instantly know the difference. Citrine is a member of the quartz family with a rating of 7 on Mohs Scale, where as Topaz is a different mineral altogether that measures 8 on the Mohs Scale. Citrine is sold under various names – gold topaz, or Madeira or Spanish topaz or even Saxon topaz. Please note that Citrine is a variety of Quartz and isn’t Topaz! 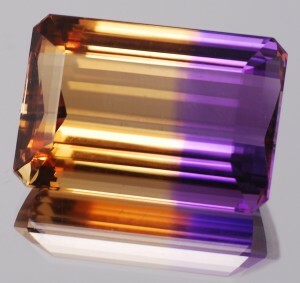 It will be interesting for you to note that although natural citrine is available, most of the citrine available on the markets is heat–treated amethyst (amethyst belongs to the same quartz group as citrine)! 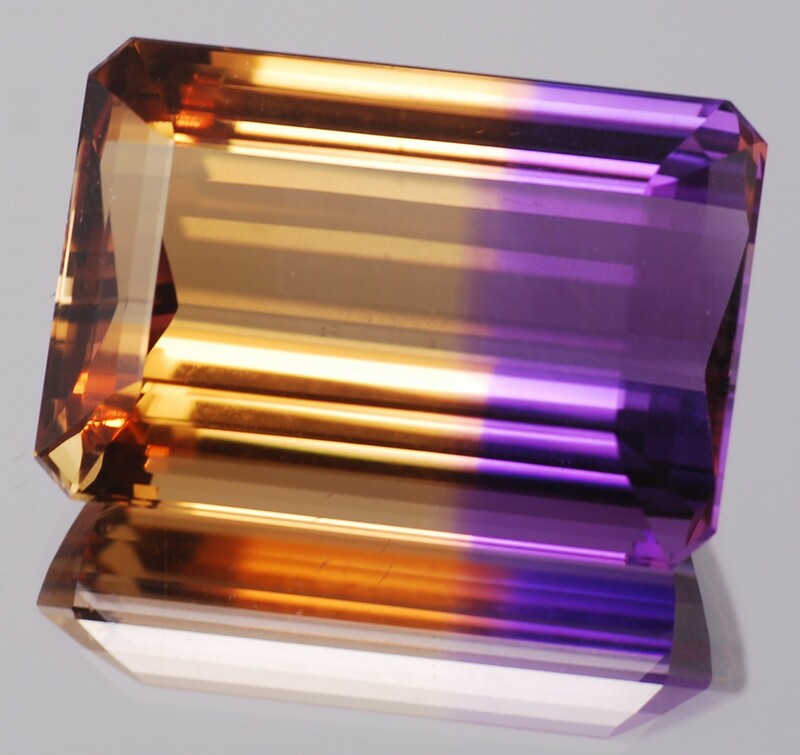 Sometimes Ametrine also can be found, it is a variety of quartz that contains both amethyst and citrine sectors in the same crystal. a) Wear a gem that is heat-treated? b) Wear a gem that is recommended as a substitute gem for blue sapphire for Saturn? c) Wear a gem that gives no tangible results astrologically? We, at Gemstoneuniverse endeavour to give you the best – be it value for your money or a piece of jewellery you will cherish, a talisman that makes a qualitative difference in your life or for that matter knowledge regarding gems. Lapidary is derived from the word lapis or stone and refers to the art of cutting and polishing of gemstones. The term lapidary takes in its ambit all of the many techniques used to make a raw gemstone more attractive and useful. While some gemstones like turquoise are polished, others must be cut to get the best out of them. 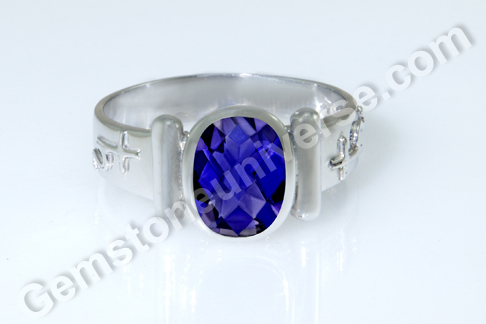 Featured today is a beautiful natural Madagascar Iolite of 2.06 carats set in sterling silver as a Saturn talisman ring. Please note that this is a Planetary Bhasma Iolite ring where the shami/khejri bhasma – the sacred herbal ash of the herb of planet Saturn has been sealed into the tubular channel, which stands as a design element on the sides of the gem. The cushion cut iolite has excellent clarity and a royal bluish violet color, exceptional among iolites – for a moment it has you wondering if it is indeed a blue sapphire! The gem has a beautiful checkerboard cut. The gem is cut into a multitude of square facets spaced regularly around the stones surface, giving a ‘Checkerboard’ effect of light and dark squares when moved in the light. Natural iolite or neeli gem, is a substitute gem for natural Blue Sapphire/ neelam gemstone and is used to harness the saatvik energies of Planet Saturn/ Shanidev in planetary gem therapy. 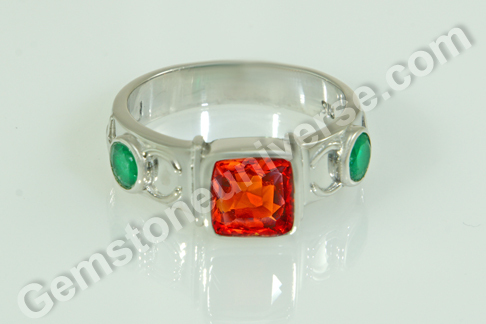 Good Gemstones and Good Gemstone Therapy are recession free- Instead they deliver whopping returns. 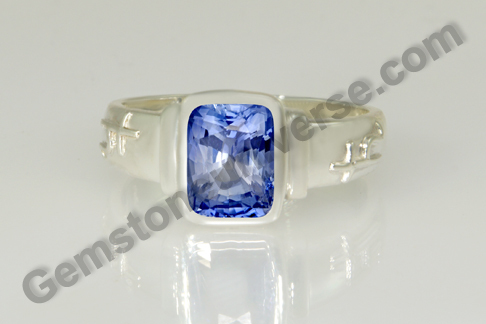 Comments The powerful Blue Sapphire was mined and cut in Sri Lanka. Totally eye clean with intense fire and lustre just like the sharp blade of a sword. All Natural with no heat and no flaws it is a top example of what exactly a Jyotish Blue Sapphire should look like. All of 3.04 carats, the 7 by 7 dimensions adds to the allure as it gives the square cushion shape to this wonder.One has to be most careful when selecting Blue Sapphires and ensure that no flaws as described in the sacred texts creep in to ensure safety and success of its wearer. – It is Natural and Unheated. – It has a fine color with electric lustre. – It has no flaws as listed in the sacred texts. In addition to providing real Jyotish Gems that work wonders we ensure that our expertise and reach helps the end patron in being a winner. This Gemstone was first listed in December 2010 and we made it available at a price of $660 per carat since we owned the rough. In the description we mentioned clearly that one would not be able to get such a Gemstone at even $1200 per carat. Today we are in June 2012 and the retail price of a Blue Sapphire which has features such as these will vary anywhere from $1800-$2000 and do get these features you will have to find a real gemstone among a heap of stones . Do research and calculate percentages and you will see tremendous value. 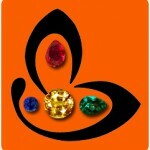 As always once a Gemstone gets listed on Gemstoneuniverse there is never a change in price whatsoever. But it is always true- A Gem is for a Gem. It waits for its wearer despite any quantum of research. Does your Blue Sapphire have that special something? 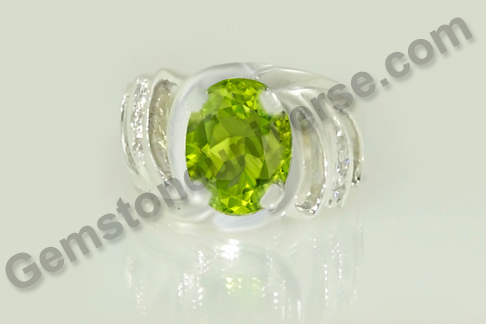 Comments One of the loveliest, eye catching and rejuvenating colors in the spectrum has been claimed by the peridot. It has a lovely green color with shades ranging from apple green to olivine green. Featured today is a Natural and treatment free Peridot of 3.47 carats from Pakistan set in Sterling silver as a Mercury Talisman ring. The oval cut peridot gem is a luscious golden olivine green in color and has remarkable clarity and electric lustre. The remarkable thing about this ornate peridot ring is the sheer beauty the diamond simulants impart to the gem. Astounding peridot of stunning color is mined from the difficult terrains in mountainous region of Suppat, Pakistan. Peridot is also known as olivine or zabarjad (it was mined earliest from an island by the same name in Egypt). Peridot is the substitute gem for Natural emerald / panna and is used to harness the planetary energies of Mercury/ Budh. The metaphysical properties of peridot are largely admired and the gem has tremendous value in gem therapy and crystal healing. It may be interesting to note that peridot also comes from outer space. How? – Pallasite is a meteorite and consists of peridot crystals (green or yellow olivine) embedded in a nickel and iron alloy matrix! Comments The very blue of clear seas – the vast expansive blue that fills your heart with hope and endless possibilities. The power of the color is tremendous, not just with the symbolism inherent in it or because of the ideas that it can foster, but more so because of the energy it carries that allows it to help manifest changes, rather transformations! Such is the expansive blue color of the cushion cut Natural Ceylon Blue sapphire featured today. The natural, treatment free Blue Sapphire from Sri Lanka has a fair jyotish weight of 2.43 carats and has astounding clarity and intense, sparkly lustre. 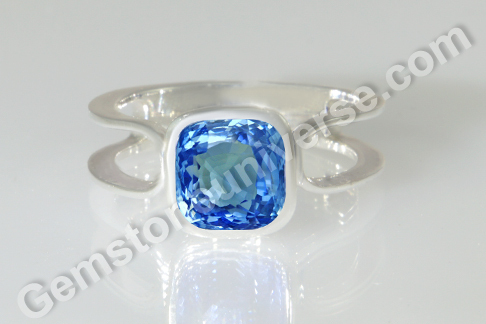 This gem with scintillating cornflower blue color has been set in sterling silver as a Saturn Talisman ring. Note that the symbol of Saturn stands in relief on the shanks of the ring. In Vedic Astrology, natural Blue sapphire or neelam gemstone is the gem of Lord Saturn / Shanidev and is a very potent tool for harnessing the extremely powerful yet saatvik energies of this planet. One must make sure that while implementing gem therapy, for successful results only the jyotish quality, treatment free, flawless natural gemstones should be used in the talisman. A natural gemstone takes millions of years to form inside the earth – only logical to conclude that cosmic energy has condensed in absolutely pure form over such period of time. Gems that have been subject to any kind of treatment (please note that heat treated Yellow/ blue sapphires are subjected to intense heat of approximately 1700-1800 degree C to enhance color!) cannot be used for gem therapy. The natural cosmic energy of the gem have been tampered with or corrupted by human intervention, solely for the purpose of getting a better price for the gem. So, would you use such a gem for your planetary gem therapy or choose a natural, jyotish quality gem? Comments The hypnotist says – Look into my eyes… And then works the magic with his gaze. What is it about the eyes, that is so captivating! Hardly looking for an answer here, for the key probably lies in the ongoing wonderment. A perfect example of the kind of mesmerism we are talking about is the natural chrysoberyl cat’s eye gem from Srilanka featured today. The cat’s eye has been set in Sterling silver as a Ketu talisman pendant. 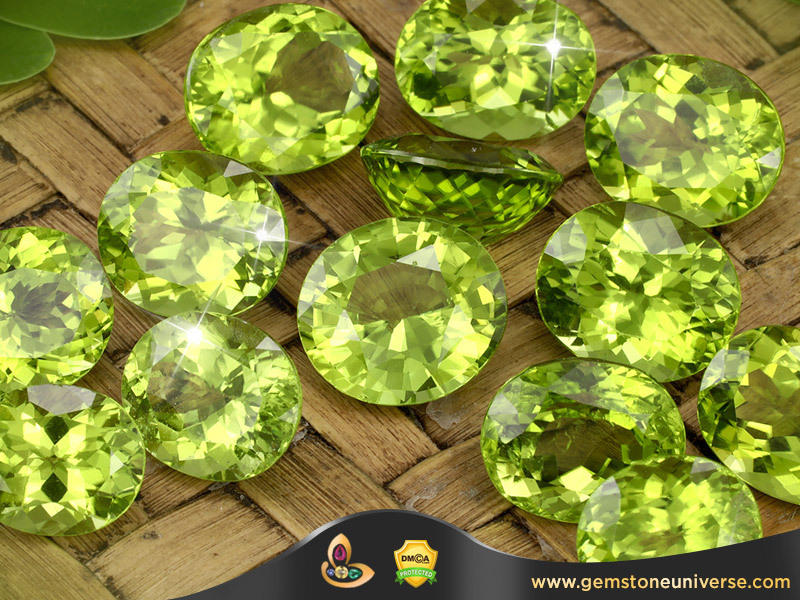 The gem is a lovely translucent golden green in color and displays fantastic chatoyancy. What sets this talisman apart is that it is designed just as the astrological symbol of Ketu and that it is a planetary Bhasma ring. There runs a tubular channel as a design component all around the gem that has been filled with the sacred herbal ash or bhasma of the herb Kusha, which is the representative herb of Ketu. 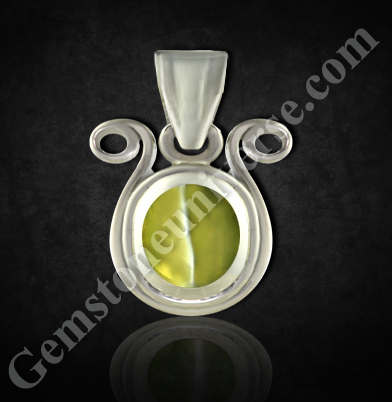 Chrysoberyl cat’s eye is a phenomenal gemstone displaying chatoyancy and is also known as lehsunia/ vaidurya or Sutra mani is the gemstone of planet Ketu or the South Node of the Moon and is used to harness the powers of this mystical planet. What Are Upratnas, Semi-Precious Gemstones, Super alternative gemstones & Do they work astrologically? Semi precious stones ? Wondering what are these, A frequent question that I often see addressed to Gemstoneuniverse and also the one that has been asked to me countless times : Do Upratnas or Semi-Precious Stones Work? If they do, how effective are they? Can they be considered equally effective as the Navaratanas? Before we dwell into answers of the above questions we should be very clear about what exactly is an Upratna or Uparatana? An Upratna or Semi-Precious Stones are a superior substitute to a Navratna- one of the Nine precious Gemstones. I frankly do not like calling a Gemstones Semi- precious, though some do, purely from the point of view of convenience. However, do note that a Gem Quality and a Jyotish Quality Semi Precious Gemstone is a valuable Gemstone. The important thing here being- Gem Quality and Jyotish Quality. Even though Indian sacred texts list the use of 84 such semi precious Gemstones, my attempt here is to share information about those substitute gemstones that deliver the best results. This is based on experience and statistical results of many years. You will find this list on more than 100,000 websites. So what is the point of making this list yet again? Well, it is relevant to our discussion. If you look at the list closely – Pearl, Red Coral, Hessonite and Cat’s Eye are classified in the gem trade as Semi Precious Gemstones for the sake of convenience, whereas the description of Shastras is accurate, factual – these are among the Nine Precious Gemstones representing the Nine Planets. All these Navratanas have to be gem quality and Jyotish quality to deliver planetary results. Please make note that in the Shastras the term Semi-Precious (or allusion to a category indicating monetary value) does NOT exist. Listed in the sacred texts are Upratnas – Superior Substitute Gemstones to be used in lieu of the 9 primary precious Gemstones for getting planetary energies and benefits. And this is what is exactly meant by Upratnas. In the Indian sacred texts 84 Upratanas have been mentioned. Each of them is used for achievement of an objective or a desire, for resolution for a medical condition, for wealth, for attracting the right partner and for different planets. Here I shall mention those, which are the best Uparatnas for the nine planetary gemstones. Even though, the efficacy of Agates/ Haqiq, Malachite/ Dana Firang etc.are legendary, we shall restrict our discussion to the Uparatnas of the nine planetary gemstones. 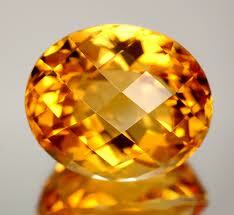 *Yellow Topaz is precious and rare and in many instances gives results that are as potent as a Yellow Sapphire. It should not be confused with abundantly available and much lesser priced Citrine, which does NOT give results as a Yellow Sapphire alternative. ** Colorless Top Quality treatment-free Zircon is a potent Uparatana and gives good results. It is often mistakenly called as Jerkin, Zarcan by ill-informed individuals. *** In the columns marked none – I have not found any gemstone that bought in superior results. What we have here is a list of 14 gemstones out of 84 choices. These are the best alternatives and deliver results that are satisfactory. I have mentioned only those, which I have noticed delivering quantifiable results first hand. Others also do work but the effect is not quite comparable to these. Moving on to the second part of the query – Are they effective? And can they be considered as effective as Navratnas? Yes, upratnas are effective and they provide good results provided they are GEM quality and Jyotish Quality. If Not, Then no results. The demand of Jewellery industry are so high that today most of the market is flooded with Semi Precious Gemstones – not necessarily Upratnas (Read what actually are Uparatnas above) that go through several treatments such as radiation, dyeing etc. to improve appearance. Treated Gemstones will give no results for Jyotish Purposes. Jyotish Quality= Gem Quality + Free from Treatment + Free from any kind of flaws listed in the scared texts. Where Gem Quality means that a Gem excels on the all 4C’s of Cut, Color, Clarity and Carat weight. Are Uparatanas as effective as the Nine Primary Gemstones? Well, there is no unit of measure or yardstick where the results between delivered by them can be compared. Here’s an example to help you understand better – if we were to travel from point A to point B, we could do that by an aeroplane or on a motorcycle. You can compare the results of Jyotish Quality Navratnas as that of an aeroplane and that of Jyotish quality Upratnas as that of a motorcycle. The important part is that they get the job done that is to traverse the distance and reach point B.
Upratnas create miracles and are a fantastic starting point for Gem Therapy. Some of them such as Peridot and Yellow Topaz have many extra benefits in addition to the planetary benefits. Mull on this – Gem quality Green Jade( Jadeite), mentioned as one of the Upratnas among the 84 that find mention in the sacred texts is known as Sang-E-Yashab ( Classified as Semi Precious in some trade circles) and is excellent for heart health, is sometimes more expensive per carat than a Ruby, Sapphire or an Emerald. In case you happen to try an upratna and it spins some magic for you, You would be inseparable from your talisman, rendering your upratna invaluable. Therefore, there are no precious and semiprecious gems – just gemstones!